Home / Shipping News / International Shipping News / Delivery of Coal Carrier “SHONAI MARU” for JERA Trading Pte. Ltd. Delivery of Coal Carrier “SHONAI MARU” for JERA Trading Pte. 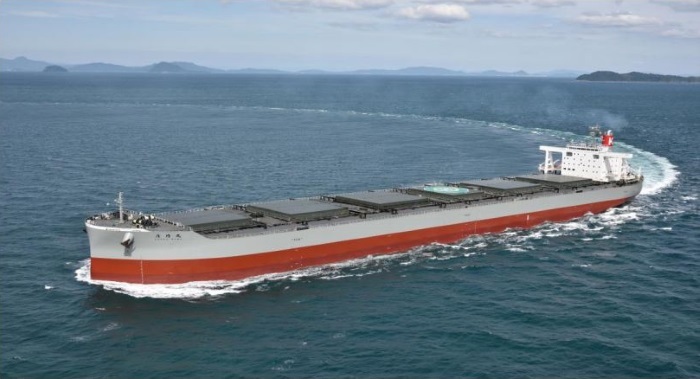 Ltd.
Kawasaki Kisen Kaisha, Ltd., Tokyo, (hereafter called “K” Line) is proud to announce the delivery of “SHONAI MARU,” a 100,000 DWT-type special coal carrier at Marugame Shipyard of Imabari Shipbuilding Co., Ltd., Japan on November 15, 2018. SHONAI MARU was jointly developed by Imabari Shipbuilding and “K” Line to maximize transport volume to the discharging port, Chubu Electric Power’s Hekinan Thermal Power Plant, Aichi prefecture in Japan. SHONAI MARU is so-called “Hekinan MAX.” SHONAI MARU is equipped with latest energy-saving and ecological technology such as WAD (Weather Adapted Duct) which promotes her propeller efficiency plus a ballast water management system that prevents damage to marine ecosystems.